Preheat the oven to 425 degrees F. While the oven is heating, slowly heat up the refried beans on the stovetop. While the beans are heating, line two large baking sheets with parchment paper. If possible make sure the baking sheets have rims on them as this will save you valuable time cleaning your oven. Put two pitas on each sheet and spread the refried beans out. The beans are similar to the marinara sauce on a traditional pizza so spread the beans almost all the way to the edge of the pitas as you would pizza sauce. Indent a little spot in the middle of the pitas, where the egg will be. Spread the zucchini and pepper chunks evenly between the 4 pitas. I like to put the chunks of veggies towards the edge of the pitas to help keep the egg in place. Sprinkle half of the cheddar cheese on the pitas and then crack one egg per pita in the middle of the pita. Sprinkle the rest of the cheese on and toss the pitas into the oven. Cook for around 12 minutes or until the egg whites are completely cooked through yet the yolks are still a bit runny. Top with salsa and cilantro and enjoy! 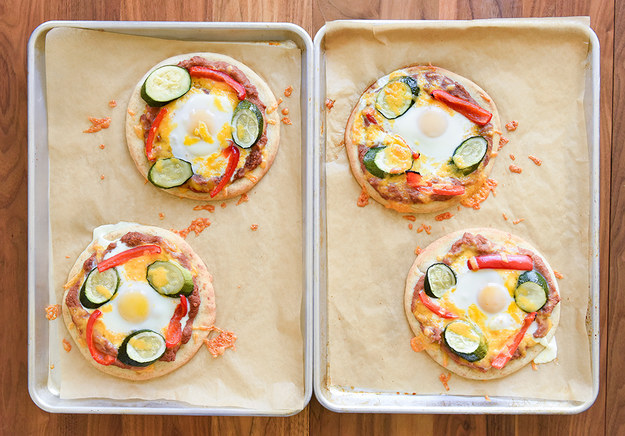 These are the perfect breakfast pizza. 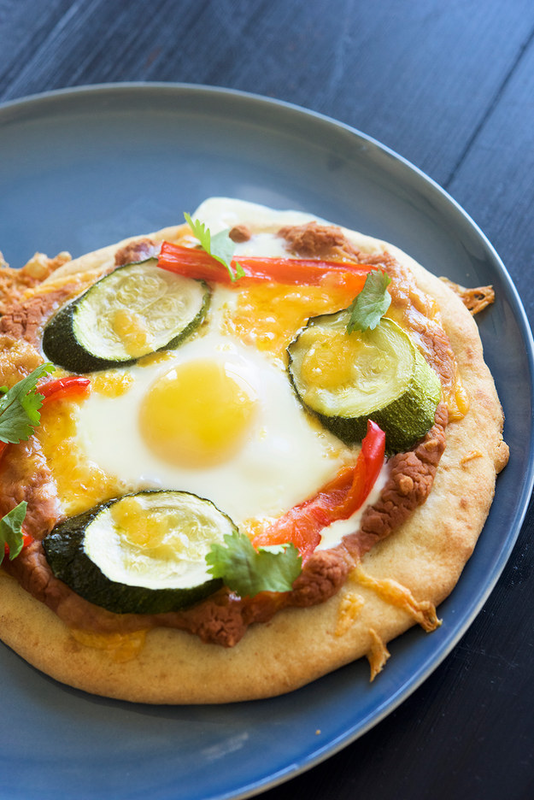 I love enjoying eggs and veggies in the morning and this dish is exactly that with a few other delicious ingredients. I like to add sour cream as a garnish as well and play around with the veggies that you want to put onto your pizza. It's also nice to add a little Sriracha or Cholula on top of the pizzas for a little extra kick.